Fixed gas detector monitors the Carbon Monoxide/CO and sounds the alarm with remote control, explosion-proof design, using high accuracy sensor, fast response and high reliability, available for measuring range 0-100ppm, 0-500ppm or 0-1000ppm for your selection. Combustible/Flammable gas leak detector use high sensitivity sensor, measuring range from 0 to 100% LEL, with sound and light alarm, big screen LCD display, large capacity of battery to ensure long running time, applied to various situation to detect the combustible gas. Pump style gas detector provides the monitoring of the Ammonia (NH3) with high accuracy sensor, and audible and visual alarming, optional measuring range 0 to 50ppm, 0 to 100ppm, 0 to 500ppm etc., LCD display, easy readout, and small design, convenient to carry. Fixed H2S gas detector is 24 hours online to detect the hydrogen sulfide and alarms with high accuracy and reliability, measuring range from 0 to 50 ppm, 0 to 100 ppm, or 0 to 500 ppm, real-time display, infrared remote control, self-calibration and zero calibration. Carbon Monoxide (CO) gas detector is fixed to monitor the CO concentration in environment or pipeline and alarm with sound and light. Being compatible with all kinds of controlled alarms, PLC, DCS and other control system, and can be remote monitored. Explosion-proof design, fast, reliable and stable. Self-calibration function, and three standard keys will be used to realize on-site maintenance. Infrared ray controller can remote realize the alarm point settings, zero calibration, and address modification. Can output one or two on-off signals, can drive ventilator, solenoid valve or other external devices. Note: Some common gases and the default ranges are listed in the above table, as well as the optional measuring range. If you have any requirements, please feel free to contact us. Due to the active chemical properties, the testing gases generally have reducibility or oxidizability. Electrons are released or absorbed in the chemical reactions and a large number of electrons form a current. The current is proportional to the gas concentration, thus the gas concentration is obtained by measuring the current. It works based on the principle that the heat is released from the combustion reaction of a surface combustible gas, namely combustion increases the temperature of the platinum wire coil and thus the resistance of the coil increases. The gas concentration is obtained by measuring the resistance value change of platinum wire. 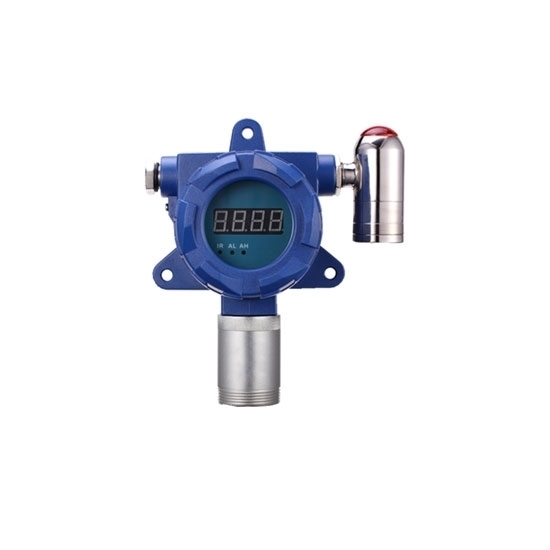 It’s suitable for measuring low concentration combustible gas. High energy ultraviolet rays ionize the organic gases, and then amplify the current of charged ions on the plate to measure. The current value reflects the gas concentration. Different combustible gas has different absorption ability to infrared ray. The concentration of combustible gas can be measured by detecting the current on the infrared photosensitive component. Due to the absorbability of semiconducting materials on gas, change the resistance value of the gas sensitive resistance to judge the existence of gas. We bought this carbon monoxide detector as we have to monitor the CO exposure in the well. The detector arrived in time and was easy to install. So far, the detector gave us twice alarming. Works so good.